Residents and business owners in Skipton and Glusburn will be offered advice over the next few weeks on how to prepare for floods. The Environment Agency is targeting properties in areas at risk of flooding along Eller Beck and Waller Beck in Skipton, as well as Eastburn Beck (Holme Beck) in Glusburn. Over 1,600 properties in Skipton and around 640 in Glusburn are at risk from the local becks, while many other properties can be affected by flooding from other sources, such as surface water. As we have seen across the north of England this winter, flooding can be extremely dangerous and have devastating effects on communities. While we continue our work to tackle flooding problems, including delivering the Skipton Flood Alleviation Scheme, we also want residents and businesses to be pro-active in thinking about the risks posed by flooding and how they can take steps to be prepared. Where possible we will use our free flood warning system to alert people and keep people updated if we think flooding from the local rivers is possible. Currently, however, only about a quarter of residents and businesses in Skipton and Glusburn who are eligible for this service, have opted to register their details. There’s a real danger, therefore, that if there was a major flood affecting these communities, we would not be able to effectively warn people in advance. That’s why we are working hard to make sure people do register, understand what a flood alert or a flood warning means, and have considered what other action they can take now, in order to be prepared. 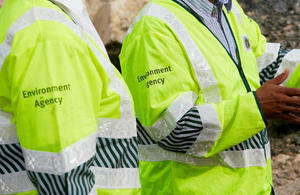 Staff working on behalf of the Environment Agency will be visiting properties in Skipton and Glusburn from 9 February onwards in order to offer information and advice, including knowing the dangers of fast moving flood water, knowing how to stay safe and how to be as prepared as possible. Many of the streams and becks in Pennine areas, such as Eller Beck in Skipton and Holme Beck in Glusburn, can rise very quickly in response to heavy rainfall, particularly when the ground is saturated. It only takes around 15cm (6 inches) of fast moving water to sweep someone off their feet, and around 60cm (2 feet) to float a car, so it’s essential that people know the signs that flash flooding could occur and do not put themselves at risk. The Environment Agency has recently started work to improve flood defences in parts of Skipton town centre. Four sites in the town centre have been targeted for improvements as part of the £13 million scheme, and two flood storage areas are also being constructed outside the town. Staff will be available to provide further updates and to address any questions or concerns raised by local residents and business owners, at Skipton Town Hall every Friday from 10am to 3pm during February and March. To find out whether you could be at risk of flooding, to register for the free flood warning service, or for information on how to prepare for flooding, visit our flood advice pages or call Floodline 0345 988 1188.